The whole wedding theme is love and harmony by unique design. 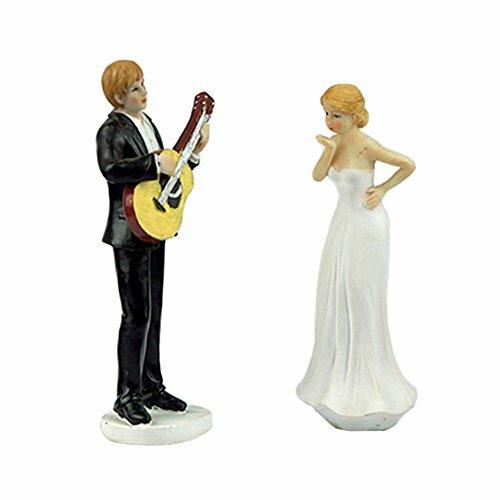 Wedding is one of the most memorial moments in life, this elegant couple figurine is perfect for cake decorating and display. Perfectly for decorating wedding cake and creating an atmosphere of romance and beauty. Use the manual process, and the process describing is through the multi-channels ,so the eyebrows, eyes are vivid. The wedding cake toppers are very funny and interesting. The wedding cake toppers are made from resin and manual painted in details. Suit for : Wedding decoration, festival decoration, festival gifts and wedding party etc. It can be used in any situation, like wedding, birthday, anniversaries, farewell, Valentine's day, Mother's day, Father's day, housewarming, sports events, parties, graduation, pranks, Christmas or any special occasion. If you have any questions about this product by Lingstar, contact us by completing and submitting the form below. If you are looking for a specif part number, please include it with your message.